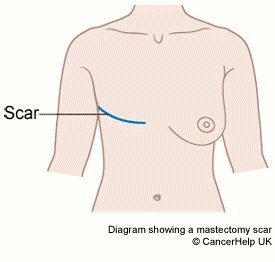 A diagram showing a post-mastectomy scar. Massage therapy treatments can help treat the scar tissue and prepare the area for reconstructive surgery. issues that arise from this surgery. Many suffer from decreased range of motion of the shoulder, pain due to scar tissue restriction, and postural changes post-surgery. For those who choose to have reconstructive surgery, massage treatments can help treat the scar tissue and prepare the area for reconstruction. The treatment plan for post-surgery involves approximately twelve, 90-minute massages. It can be a slow process because it is important to take into consideration clients’ pain level, as well as tissue integrity. Ideally, treatment would start 10-14 days post-surgery, however in most cases it begins after that time frame. As a Registered Massage Therapist, taking the clients’ emotional state into consideration is a priority. A cancer diagnosis, as well as the various treatment methods, can leave women and men in a very fragile state. Massage therapists are here to support you emotionally as well as physically. It is okay to shed a few tears during the treatment, and we are here to support and listen to you. Many find the treatment process draining, as acceptance of the physical changes can be difficult. Massage therapy will help you as you recover both physically and emotionally.